Do you know of a pet living nearby in neglectful conditions? Use pocket posters to send a strong message to the household in English and Spanish. There are 10 messages. Print them now and have them ready in your vehicle or bag. 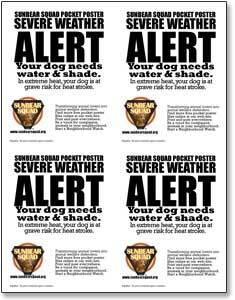 When you encounter a neglected animal, put the appropriate pocket poster in the entrance or on a fence. If the pet is too weak to move or is bleeding or is trapped inside an empty building, use your phone to call 9-1-1. As you travel through your busy day, you can help protect a neglected animal by communicating with the owner with a pre-printed note. They are free; download the files today. Four pocket posters print on one letter-size sheet; cut them apart for use. 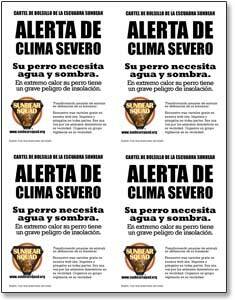 Print one side in English and the reverse side in Spanish, if you are in a bilingual region. Give your dog more water. Your pet needs more food. Your dog needs a dog house. Your pet needs medical attention. Your dog needs attention from you. Your dog needs water and shade. Your dog needs a wind block. Your dog needs straw insulation. April is “Prevention of Animal Cruelty Month” for the American Society for the Prevention of Cruelty to Animals. This month we’ll highlight ways you can help prevent cruelty. Sunbear Squad provides tools, knowledge and inspiration to help you help needy or neglected pets in your neighborhood and community. Be ready to prevent cruelty by keeping Pocket Posters handy. Be a voice for those who have none.